The first big, public debut of the Hue Jackson era will take place right here in Columbus at Ohio Stadium. 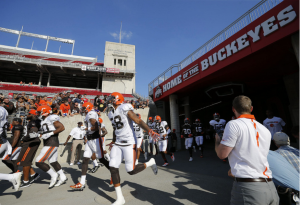 The Cleveland Browns and their new head coach will hold their annual Orange & Brown Scrimmage at the Shoe on Saturday, August 6 from 3 p.m. to 5:30 p.m. Tickets are free. The game could also mark the start of the Robert Griffin III era in Cleveland, as the Heisman Trophy winner and 2012 NFL Rookie of the Year hopes to revive his career after a couple of injury-plagued seasons with Washington. Former Ohio State quarterback Terrelle Pryor is a member of the Browns, and continues to make the transition to wide receiver. He was with the Browns last year at the Orange & Brown Scrimmage, but did not play. This is the third consecutive year – and second in a row here in Columbus – that the Browns have held their most popular training camp event outside Cleveland, as the team continues its efforts to expand its base of support. Last year’s inaugural Orange & Brown Scrimmage drew 49,734 fans to Shoe, the highest attendance of any Browns scrimmage or Family Day since totals were first kept in 2005. This year’s attendance should surpass the 2015 total, as the renovation work on the Shoe that limited the number of tickets available last year has been completed. One of the Browns’ goals is to become “the state of Ohio’s professional football team” and holding the Orange & Brown Scrimmage in Ohio’s fastest growing major metropolitan area – and a city that loves sports – is a big part of the plan. Columbus is the second-largest base for Browns’ season ticket holders, behind only Cleveland, according to team officials. The day’s activities begin at noon and will feature many exciting pregame activities at St. John Arena. The Browns once again will bring Dawg Pound Drive, which was launched in 2014 and offers fans an interactive pregame space for Browns alumni autographs, a meet and greet with mascot Swagger, a live music stage, food and beverage specials and other entertaining elements. And then there’s the scrimmage, a chance to see the new-look Browns up close, stars such as Joe Haden (DB) and Joe Thomas (OL). So far, Jackson likes what he’s seen. The players seem to like what they’ve seen in Jackson, a long-time NFL assistant coach who was most recently the offensive coordinator for the Cincinnati Bengals. The Browns have several question marks, as well as a few intriguing possibilities. They took speedy wide receiver Corey Coleman (Baylor) with the 15th pick in the draft, after trading down from No. 8 to stock up on draft picks. The hope is that Coleman can replace Travis Benjamin, who was lost to free agency, and be a big-play receiver. The Browns selected defensive ends Emmanuel Ogbah from Oklahoma State and Carl Nassib from Penn State with their next two picks. Will they be able to provide pressure from the edges? And what about the potential of USC quarterback Cody Kessler, taken in the third round? Could he be in the mix for playing time along with Griffin, incumbent Josh McCown or even Connor Shaw? Free registration for the Cleveland Browns 2016 Orange & Brown Scrimmage opens to the team’s season ticket members exclusively on June 21 and to all fans on June 23 through www.ClevelandBrowns.com and the Browns Mobile App.